The NYS Gaming Commission reports that Madgirl was killed – “comminuted fracture, euthanized” – while training at Belmont Friday. The 2-year-old filly had been raced once, August 28 at Saratoga. 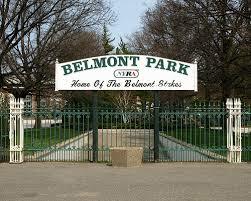 She is the 5th dead racehorse at Belmont this month, 27th on the year. This, at a Triple Crown track. Vile, indeed. “comminuted” in other words the severity of the fracture resulted in the bone being smashed into small fragments. Typically, they don’t disclose the real nature of this catastrophic injury but no doubt a limb injury and probably a cannon bone. Yep, they just continue to smash up these babies day in, day out. Poor little baby horse just a 2 year old filly, so innocent – bred purely for the purpose of gambling. This poor filly Madgirl – so sorry for you. After being purchased for $230,000 she was, more than likely, shipped out of Saratoga into a training barn where the torture begins long before her muscoskeletal system is fully developed. Probably pumped up with pain masking drugs – she probably got BUCK SHINS, but the secret medical records/treatment continue to protect these abusers. Sure she has every right to spend her money where she wants, but just think about the hundreds of racehorses or animals or children that $230,000 would have helped. What a waste of money, and another life. While this business continually boasts about record sales, and wagering profits rescue groups don’t even have a 1-800 number to call to get them out of harms way. Anywhere you go there is an animal shelter to call if an animal is in distress or being abused, but NOT horse racing. How do they think that this is okay? IRAP – broke down yesterday in the Grade I Pennsylvania Derby shattering his left sesamoids – a horrific display of animal cruelty if you watch the replay. His trainer, Doug O’Neill, is a multiple drug violating trainer who has multiple racehorses DIE under his direct training methods. He released a statement that Irap lived, and going to the clinic on Monday. paraphrase. Irap started making money for pro-horse racing people when he was a yearling – he sold for $140,000, then subsequently sold for $300,000 as a 2 year old in training. We are all too familiar with horses started at a young age, and being pushed to breeze in the 2 year old shows. The physical ailments usually start at this point, get masked with dope, and they continue to play Russian Roulette with their lives. We will never know what chronic conditions Irap may have because they keep their medical records secret, and Doug is known for being a regular user of Shock Wave Therapy. It does become discouraging to see the same crummy trainers/ owners being able to continue running their horses at our local track. Our local track even has the security of announcing on their website the NEXT TWO years racing dates! We have seen the results of shock wave therapy used EVERY day for two weeks up to and including the race day that a mare died in the 2nd race of the last day of the meet in 2004. We will NEVER forget how that poor mare broke BOTH front legs that the trainer we were galloping horses experienced.That crummy trainer along with others are plying their trade right now preparing for the upcoming fall / winter meet. I saw an article where they “THINK” Irap’s injuries are career-ending. Really. He’ll be lucky if it’s not life ending, Between infections and laminitis. Then they hope to send him to stud duties. Great. Another broken down 3 yo that needs to pass on his frailty? And in the Gallant Bob Stakes at Parx yesterday- 3yo Coal Front sustained a condylar fracture. He is also off to surgery today to fix his leg. Regarding Irap, SD, I completely agree. And to Coal Front? – I’m so sorry, little one…what lies ahead for you now that racing has stolen your young and sound limbs. Furthermore, fraility, and drugs being passed on in the breeding shed – no doubt. Coal Front trained by multiple drug violating trainer Todd Pletcher who has left multiple racehorses dead in the dirt. Moreover, TP has sent lots of racehorses to the breeding shed like the other multiple drug violating trainers. They continue to support these animal abusers who continue to. maim and kill races. HORSE KILLING – you darn right! TY for sharing Irap’s racing injury, Gina…he deserves to be recognized. DON deserves a jail sentence for animal cruelty. But of course, animal cruelty is accepted in horse racing. And it is quite telling that there are those in racing who call Doug O’Neill, Drug O’Needle. I just read that Coal Front came through his surgery well- and the prognosis is GOOD to RETURN to racing! And to top it off – the horse had THE SAME injury on the opposite leg as a 2 year old!!! And yet the horrible connections still want to race him!?! What the hell?! Apparently they want to break ALL his legs! You can’t make this stuff up…how appalling, SD. Is anyone surprised? This industry continues to repulse me daily. I swear just when I think this industry can get no lower – they do. There is no bottom in this business there is only an endless pit of pain, suffering, and death for these racehorses. The true value of horses, by this industry, is unconscionable and tragic — it strikes to the heart of so much animal suffering — the horses’ commodification. When there is profit to be made on the backs of animals, history shows that those backs are often strained and broken — SHUT DOWN THESE TRACKS! I like that, Trish! EXPOSE & CLOSE! Great slogan Trish, and so appropriate for this situation. I’m all in – EXPOSE & CLOSE.